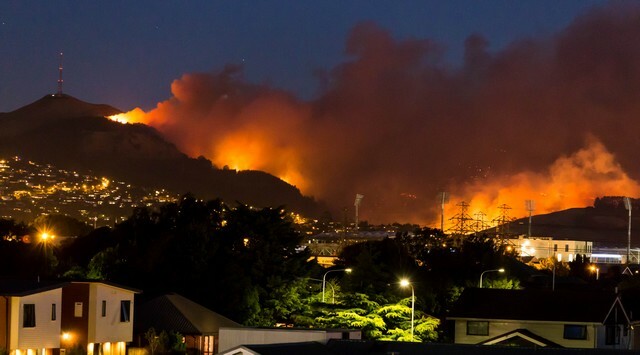 The 2017 Port Hills fire brought the country to the town in a frightening way. Nine houses were destroyed and five more damaged, and over 1400 residents, most of whom were living on small urban fringe or suburban properties on the margin of Christchurch, were evacuated. Though New Zealand has experienced fires on the fringes of cities before, none had threatened such densely populated urban areas to this extent. To gauge how people reacted to this fire on their literal doorsteps, Dr Lisa Langer and Simon Wegner examined how the fire was reported in the media, and the opinions of people commenting online to gain an indication of how urban residents perceived the fire risk, the social norms that shaped discussion, underlying conflicts and their understanding of where the responsibility for action lies. Generally, the mood of the public was one of surprise that a wildfire could threaten city neighbourhoods, and there was an expectation that authorities could, and would, control the fire. Rural residents were assumed to have more fire knowledge. Largely missing from mainstream media were actions that individuals could take to mitigate fire danger and loss. For example, properties generally were described as saved due to firefighters’ efforts and elements of luck, not property characteristics or mitigation efforts such as keeping grass mown or planting fire resistant plants. And any suggestion that some responsibility for loss lay with property owners was quickly shut down as victim blaming. In the mainstream media narrative, responsibility for action was laid largely on officials; far less emphasis was placed on the roles and responsibilities of individuals or communities. But interestingly, complaints about the way evacuations were communicated and handled were met with strong counter responses on social media emphasising the need for accepting personal responsibility. Overall, mainstream media followed a relatively uniform narrative, while public comments reflected the differences and divisions that make our society complex. “We don’t know if this experience has changed urban fringe dwellers’ awareness of wildfire, or if it has influenced them to do more now to mitigate the risk of, or prepare for fire, at home or in their community. This initial research has led to plans to undertake a more thorough study of residents’ reactions,” says Lisa. “The Port Hills fire has shown that urban fringe residents are a new audience that needs to be aware of wildfire risks and be prepared for fire disasters that are likely to occur in the future. Wildfire social research has been an integral part of Scion’s Rural Fire Research Group for 15 years. It has contributed a wealth of knowledge to the fire sector within New Zealand. Lisa and Simon’s research was supported by the Resilience to Nature’s Challenges National Science Challenge.